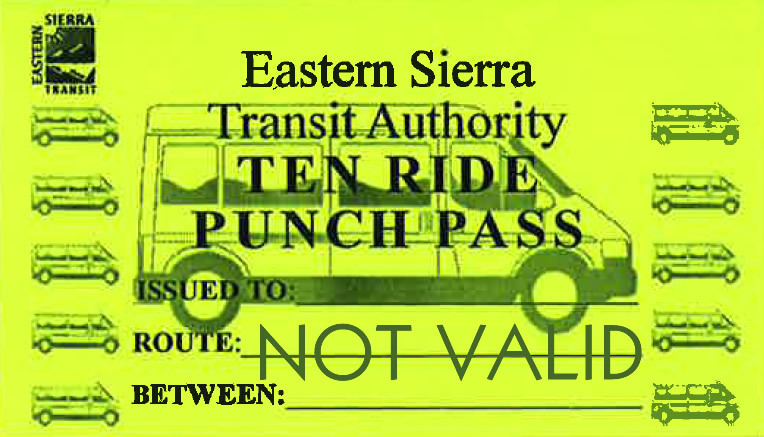 The 10 ride Town-to-Town Bus Punch Pass is valid for the Mammoth Express route between Bishop and Mammoth Lake. Local ticket pickup is available Monday-Friday from 8am to 5pm at the ESTA Bishop Office (703 Airport Road, Bishop CA). Due to a Low Carbon Transit Operations Program (LCTOP) grant being awarded, 50% reduced fares are offered on the Mammoth Express route 10-punch pass through June 30, 2017. Read more here. 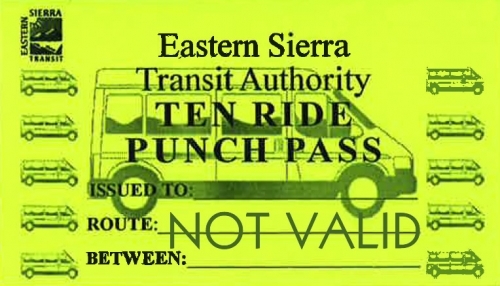 This pass has one price rate for all passengers, including adults, seniors, youth and disabled. Children under age 5 ride for free when accompanied by an adult.